SPACE STATION NATHAN: The NaNoWriMo Monster Has Taken Over! It's true! He came sixteen days ago and started messing with the blog! The goofball "On the Floor" dream comic from last week was all his fault. He's the National Novel Writing Month Monster! And he's consuming massive amounts of creativity! He barely leaves anything for the blog. I know you are all patiently waiting for Part 2 of the Space Weed. There was also another interview planned (I can't say who yet, somebody awesome though) but everything's on hold. We're gonna have to get through the rest of the month with this NaNoWriMo Monster in the room. Today is November 16. You have 14 more days to mess with this blog. (if you dont count weekends, then I'd say ten)Have fun eating up all the creativity, but once November is over, and if you're still here. I'll... I dont know. But I'll think of something. Is that clear? HAR HAR HAR YAR! 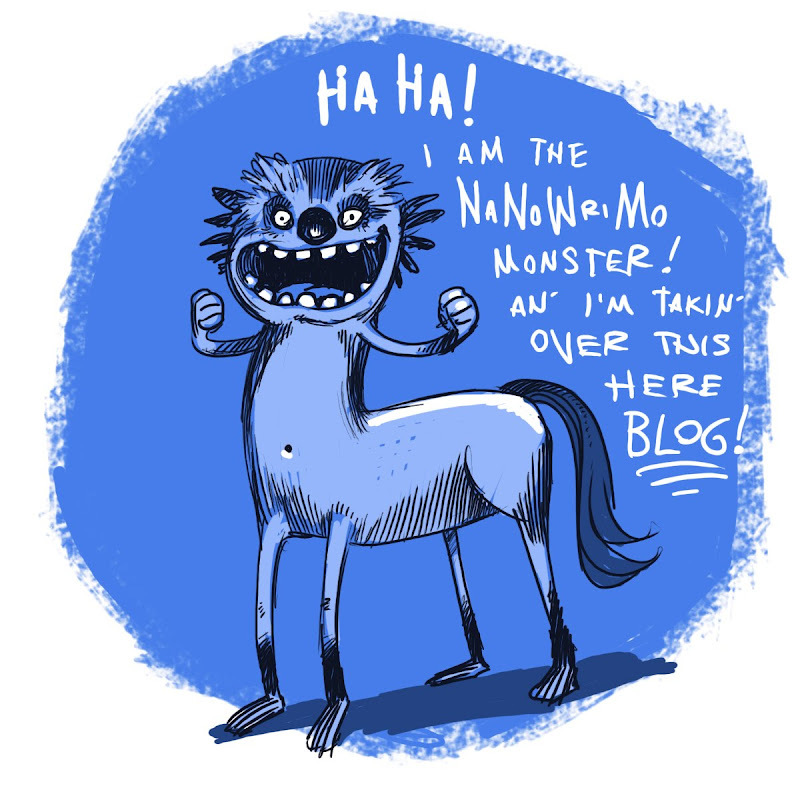 I'm the NaNoWriMo Monster! Wri MO! And MO! and MO! And MO-O-O-O-O! Taken him into his secret lab and brain-washed him, made him into some terrible moster meant to ruin one awesome blog!!!! You've got November, bud, before I go and find that lab, and ruin your terrible sceme. Ooooo, whatcha gonna do 'bout that?